The third song of Gettysburg's trilogy is over. The first spin of Iced Earth's new album comes to an end. I would like to tell you that The Glorious Burden is the best ever Iced Earth record, but what an enormous lie it would be. In fact, since Burnt Offerings, Iced Earth never sounded so weak, so divided. For the first time since I fell in love with this U.S. heavy metal band - that was for Dark Saga - the song-writing is weak, lacking inspiration, almost tasteless. Worst, there is no killer track ... except may be The Reckoning (used for the single). So what happened ? How the promising best US heavy metal band felt so quickly ? Well, let's go back to the word I used : DIVIDED ! From one part, there is this magnificent voice - Tim's voice of course - who saves the "printing" of the album. But unfortunately for Jon - oooops Iced Earth - it sounds too much like Rob Halford has been "invited" to sing on the new Iced Earth. Iced Earth's music ? No, I should I say an awful Iron Maiden copycat version. For the first time since I know Iced Earth - ooooops sorry Super Jon - the riffs are tasteless, copy-pasted a thousand time from previous Iced Earth albums (not to say Iron Maiden). 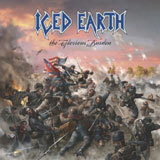 Iced Earth's classic riff and rhythm is dead, gone, disappeared, vanished away, crucified ! Honestly, you will have the feeling to listen to Judas Priest meets Iron Maiden for the most part of the album. Pathetic ! Strangely it coincides with the departure of Matthew, but I prefer to leave Jon with his own "devil" thinking. Divided ? Hell yes. When I do not have the feeling that Iron Maiden wrote this album twenty-years ago, Demons And Wizards comes to my mind. That's true for When The Eagle Cries, Valley Forge and Hollow Man. Ah Hollow Man, the famous track that Jon didn't want to give to Century Media because it is a killer, a masterpiece. Tim does an excellent job (again) on Hollow Man, but compare to I Died For You or Melancholy (Holy Martyr), this Hollow Man isn't the expected killer. Tim Owens is not Matthew and he is definitely not ... Hansi Kürsch.Yes this record is divided because some songs were written for the next Demons And Wizards, but Super Jon kept them for himself - ooops sorry, for Iced Earth. At this stage, I am wondering how the new label impacted Super Jon ? Money ??? Except The Reckoning - the single - the only track that saves the day is Red Baron / Blue Max. Guess what ? This is the only track where Tim Owens was allowed to work on (lyrics). This might be the "hope door" for Iced Earth ... if Jon accepts to work as a team of course. After many spins, Waterloo, Attila, Declaration Day and Red Baron / Blue Max became my favorite tracks ... but Iced Earth remains at a thousand light years away from Horror Show. At that time I though I over-rated Horror Show. Well today, after the listening of The Glorious Burden, I realize how Wolf or Dracula were not over-rated. Iced Earth was my favorite band ... but you know, nothing is eternal.